"Very quickly our fleet will grow to respond to demand," Lime's director for France, Arthur-Louis Jacquier, told AFP. The new e-scooters arrive as Paris faces problems with two of its flagship transport innovations over the last decade which forged the city's reputation as a pioneer for new forms of commuting. The city's bike-sharing scheme Velib', launched in 2007 and since copied around the world, is in disarray after a change of contractor led to major problems and a shortage of bikes. Paris city authorities estimate the loss incurred from cancelling the deal at "several tens of millions of euros" while Bollore, owned by French magnate Vincent Bollore, expects it to be up to 300 million. Lime and other private operators of new transport-sharing solutions are looking to capitalise on the problems with Velib' and Autolib', which are both backed by public money. Chinese bike-sharing groups such as GoBee and Ofo as well as Singapore's Obike have piled into the French market, adding to the ever-expanding range of options available to commuters and travellers. As well as pedal-bikes, electric bikes, electric mopeds, motorbikes and cars and buses, Paris' streets are also awash with skateboards, scooters and increasing numbers of battery-operated unicycles. They will not be allowed on pavements, the company said, adding that prices are a minimum one euro per hire, then 15 centimes a minute. then 15 centimes a minute. That's mad expensive. At top speed you're going 400 meters a minute, so it costs you 37.5 c/km at best. Fuel for a conventional scooter costs you 5 c/km, and it's yours to keep, and you can keep up with cars on the road so you don't have to travel dangerously at half the speed on the side of the road next to cars that are going 40-50 kph (not being allowed on the pavement). This thing has only space on the roads on the dedicated cycling paths/lanes where it competes with bicycles, which already come in electric versions, and again cost 0 cents per minute because you own the thing. The only advantage I can see is that you drive the scooter for a distance, at a huge cost, and then discard it, but then the scooters are scattered all over the city and you can't know if you'll have it for the return trip because someone else might pick it up, or the company recovers it while you're drinking your coffee. Even shared bike schemes have huge issues with the scattering problem. My city recently purchased hundreds of used bicycles and hired a bunch of unemployed workshops to fix them and paint them in the city colors, put ad stickers on them to pay for it etc. and launched a bike sharing problem. A month later, the bikes were found abandoned in parks, standing alone on bridges, thrown in ditches and fished out of the river, wrapped around streetlights... etc. Because they're owned by nobody, nobody cares for them. 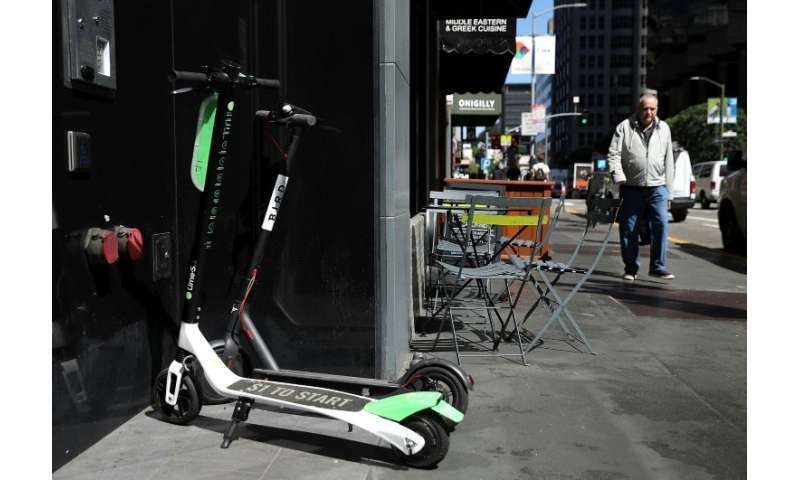 For electric scooters that are in public use, what's likely to happen is people just pick them up, pull the batteries out and throw the rest away.